Well most of you know that I am going to get a granddaughter here in June. 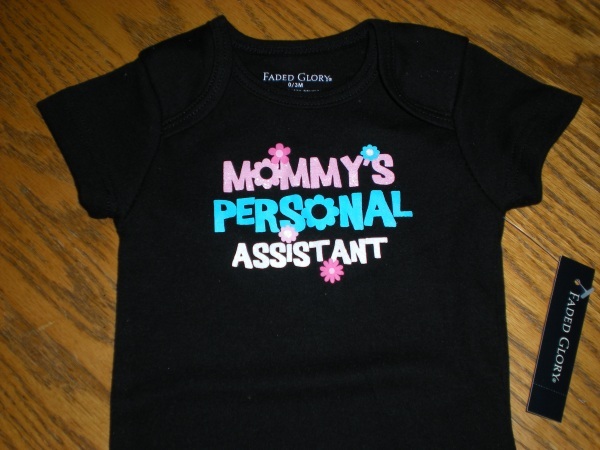 Well we went grocery shopping last night and as we were passing the baby department at Walmart I spotted a onsie that said "Mommy's Personal Assistant". My Liz for years has been my personal assistant in life. We go to an appointment and she is the one writing down the important info we just got, go through drive thru and she is pulling out the correct card to pay etc... She has always been my little helper and loved being my Personal Assistant. So when I saw that onsie I had to get it in hopes that her little girl will one day be her little Personal Assistant. I might have to go back and get it in all the sizes!! !